Posten, Swedish Post, is running a “feel good” advertising campaign for Christmas, reminding viewers of their television commercials about the ongoing power of sending personal letters during the festive season. The theme for the Christmas campaign is “Send many Christmas cards. Have many friends”. A young boy finds it difficult to speak to the girls in his class at school. Time and time again he has the opportunity but not the courage. Finally, with the help of Posten, he works it out. “Skicka många julkort. Få många vänner” is translated in English as “Send many letters. Have many friends”. 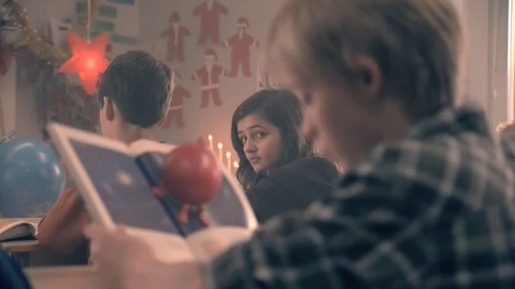 The red ball in this year’s commercial, personifying Posten’s useful service, was introduced in the 2008 Christmas commercial. The Posten campaign was developed at Akestam Holst, Stockholm. Filming was shot by director Johan Tappert via Folke Film.